The pinnacle of the spaghetti western canon, DJANGO director Sergio Corbucci’s crowning achievement stars Klaus Kinski (AGUIRRE, THE WRATH OF GOD) and Jean-Louis Trintignant (AMOUR) as a vicious bounty hunter and a mute gunslinger, who lock horns in the snowy mountains of Utah during the Great Blizzard of 1899. Inspired by the recent deaths of Che Guevara and Malcolm X, the film is notable for its explicitly radical politics and dark tone, matched by an atypical snowbound setting and beautifully haunting score by Ennio Morricone. 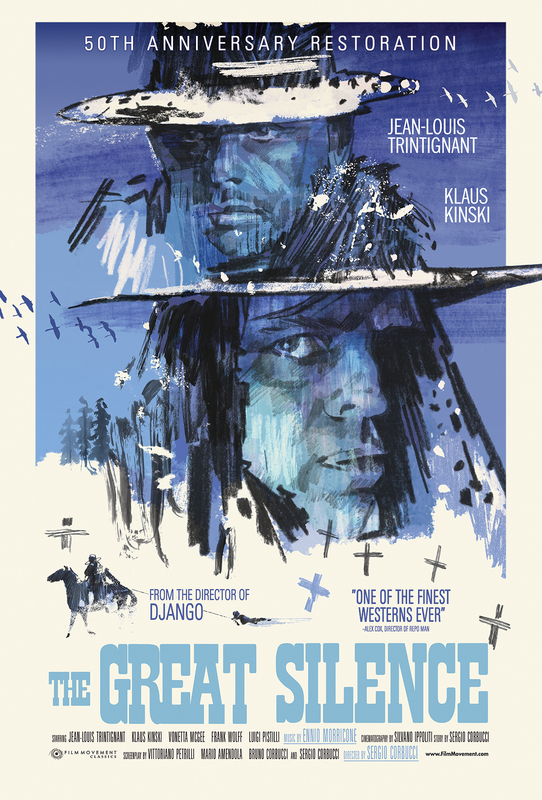 The most influential Western you've never seen, THE GREAT SILENCE has been an inspiration to filmmakers - including Quentin Tarantino who referenced the film's wintery setting in THE HATEFUL EIGHT. On an unforgiving, snow swept frontier, a group of bloodthirsty bounty hunters, led by the vicious Loco (Klaus Kinski) prey on a band of persecuted outlaws who have taken to the hills. As the price on each head is collected one-by-one, only a mute gunslinger named Silence (Jean-Louis Trintignant) stands between the innocent refuges and the greed and corruption that the bounty hunters represent. But, in this harsh, brutal world, the lines between right and wrong are not always clear and good does not always triumph. Featuring superb photography and a haunting score from maestro Ennio Morricone, director Sergio Corbucci’s bleak, brilliant and violent vision of an immoral, honorless West is widely considered to be among the very best and most influential Westerns ever made.